Every Girls’ Hostel in Rajasthan has a safe, comfortable and child friendly environment conducive to learning and fulfillment of every child's’ potential. Sharde hostels aim to provide housing and support to the most underserved girls of the state who are continuing their education with the help of the government. This initiative constantly requires continuous infrastructure upgradation and enhancement as the government strives to improve the facilities in these hostels. Beautification of the campus, including developing gardens. Overall Experience of Girls. Both infrastructure needs and improvement of the hostel environment greatly contribute to the overall experience of the student living in the hostel and make their stay even more comfortable. Health of Girls. Quality infrastructure will increase the overall health of the residents. In particular, through access to RO filtered water, a refrigerator to keep food safe, and air cooling in the hostel. Increased Safety. The installation of CCTV cameras will ensure the safety and security of the residents within the hostel. Well-rounded Opportunities. Through the creation of a Computer Room, girls can have a more well-rounded lifestyle that includes adequate space for academics in addition to resources for activities and sports. Over the past few years the government has developed various facilities in the Sharde hostels to ensure the comfortable stay of all girls living there. However, it seeks support to upgrade the already existing facilities and making the experience of the students even better. 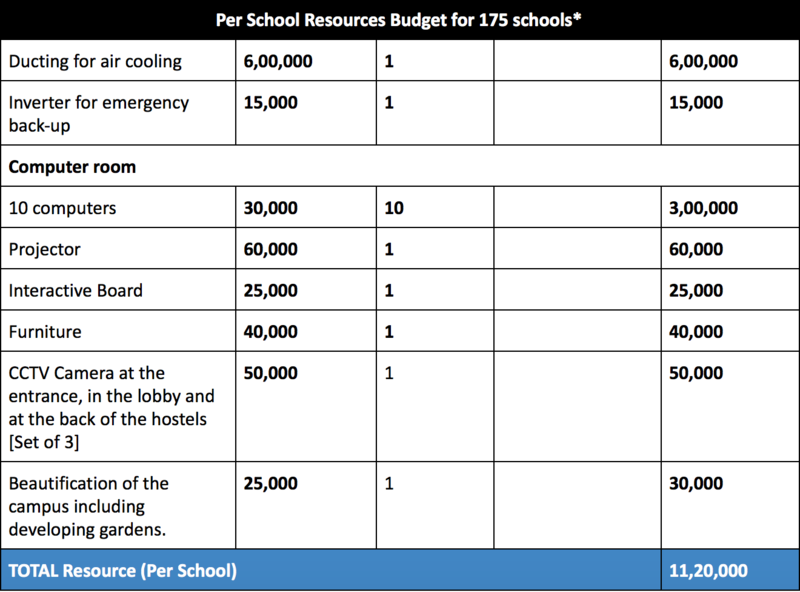 ● Facility enhancement in 175 hostels including Ducting, CCTV cameras, beautification, etc. Hostel facility is an opportunity for low income families to let their children [ especially girls ] access education. KGBVs/Sharde Hostels provide support not only education but also critical amenities to support everyday life. This is critical to ensure girl children stay in school who are often pulled out because the families cannot afford these basic facilities.